These look fabulous! 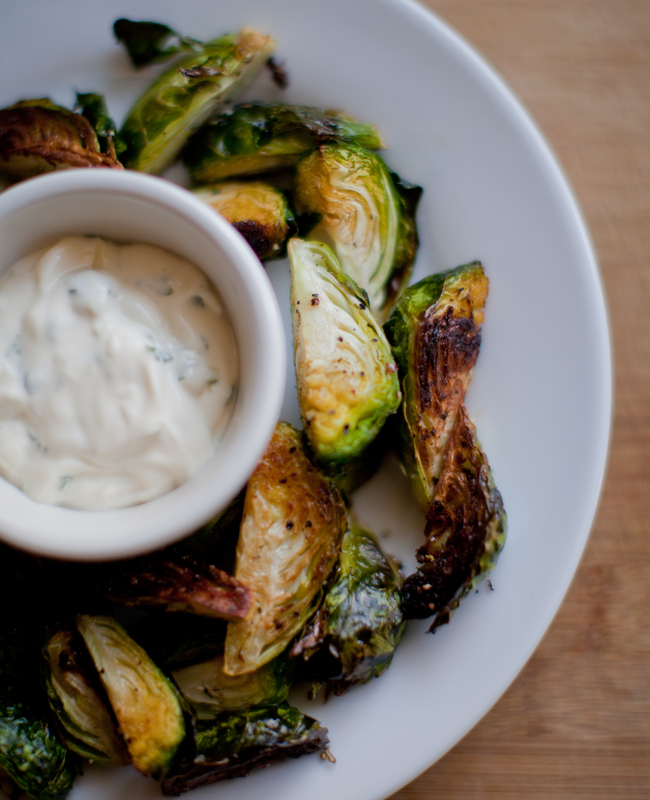 I really like the idea of serving brussels sprouts with aioli like this. Sounds really lovely. It does look so good, I will experience it next week. Wow, this looks amazing. Wasn’t a fan of brussel sprouts in my early days, but have been loving them recently. Definitely will be trying this recipe. Thanks! I bet your Mama never thought of serving them like this! Yum! These look GREAT! That’s why I didn’t like brussel sprouts until about four months ago!!! Yum! Brussels sprouts are amazing as is, but add aioli? Fabulous. Thanks for the idea! I think brussels sprouts get a bad rap because their often served from the frozen section of the supermarket. Fresh sprouts are crazy good! Grate it on a rasp. Cannot get any finer than that! My sister always said that she hated brussel sprouts, because they’d been frozen & the way that our mother & grandmother prepared them. I still liked them, but fresh sprouts that are roasted, we BOTH LOVE them! Inspired by your recipe, I tried it. It was tasty, although I would bake the sprouts for about 10 minutes instead of 15 – they were a bit soft and I would have preferred them crisper. The aioli was ok, I should have used less garlic or did a quick saute of it first so it wouldn’t be so potent! But it even an herbed mayo would have been awesome. So glad you tried it! Yes, if a little too much garlic gets in there then I can definitely see it being potent. 🙂 I specified to use a small bulb of garlic but perhaps with your feedback I’ll put in an exact amount like a half tsp to make sure that no over does it. Thanks so much! YUM! I have brussel sprouts in the fridge and will definitely make this. Cheers! Sounds delicious. I’m always up for trying new brussel sprout recipes. Thanks! I didn’t know how much I loved Brussels sprouts until I had them this way. I’ll often times just use the ingredients that the lamb cooks in a sauce for Brussels. 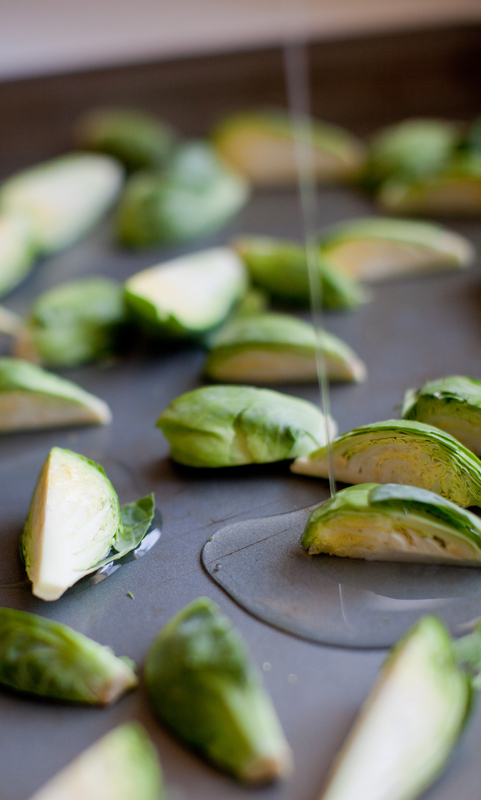 We love Brussel sprouts and I will be trying your recipe this weekend for the whole gang! im going to make these, but im going to use sage instead of parsley and make the aioli from stratch!!!! delicious! I can hardly wait! I already like em roasted.. but I can’t get enough garlic… I’m gonna love that Aioli I’m sure. Thank you for posting this! Brussel Sprouts dipped in garlic aioli?? Brilliant I say! I will be trying this tomorrow for sure. I have roasted brussel sprouts all the time, sprinkled with grated parmesano reggiano and a spritz of lemon. I think I’ll try a garlic-olive oil or safflower oil (can’t have the mayo). I’m not sure of your dietary preferences, but would a great yogurt based dip work? Otherwise veganaisse might work. I’m not sure about yogurt because I haven’t tried it. But I actually love veganaisse and think that would probably work the best. Hope that helps! Love. Love. LOVE! Made it this evening, I don’t know what possessed me to do so, we all hate brussel sprouts. We fought over the last piece tonight! I made the aioli with greek yogurt instead of mayo and it tasted great. My 3 year old even inhaled them! Thank you! Thanks so much for this recipe. I found it on Pinterest, and made it today for my Mom’s birthday. I roasted some Asparagus along with the Brussels sprouts, and everybody from my 2 year old daughter, to my Grandma loved it. Simple and lovely! These look like the perfect pupu plater! I followed your recipe exactly. They turned out AWESOME. I feel like I only did one thing with sprouts before so I’m super excited. The aioli was great too, I think I’m going to try it with frites! made these last night and they were a crowd-pleaser! thanks for the recipe! I’m so sorry but I don’t have the nutritional information…. Can you use sour cream instead of mayo? This looks like a great way to enjoy Brussels Sprouts, which I already happen to love! This looks great! Brussel sprouts are a staple in my supper and lunch rotation it is always nice to get new ideas. Thanks for sharing! Hey this sprouts recipe sounds great. i surely will try this one. thanks for sharing this one. its aluck that i found that today. I used low fat mayo and added a little more garlic to the aioli. I made half the amount of aioli and lots of brussel sprouts I am on weight watchers and it came out to just 4 Points Plus and made a great lunch. 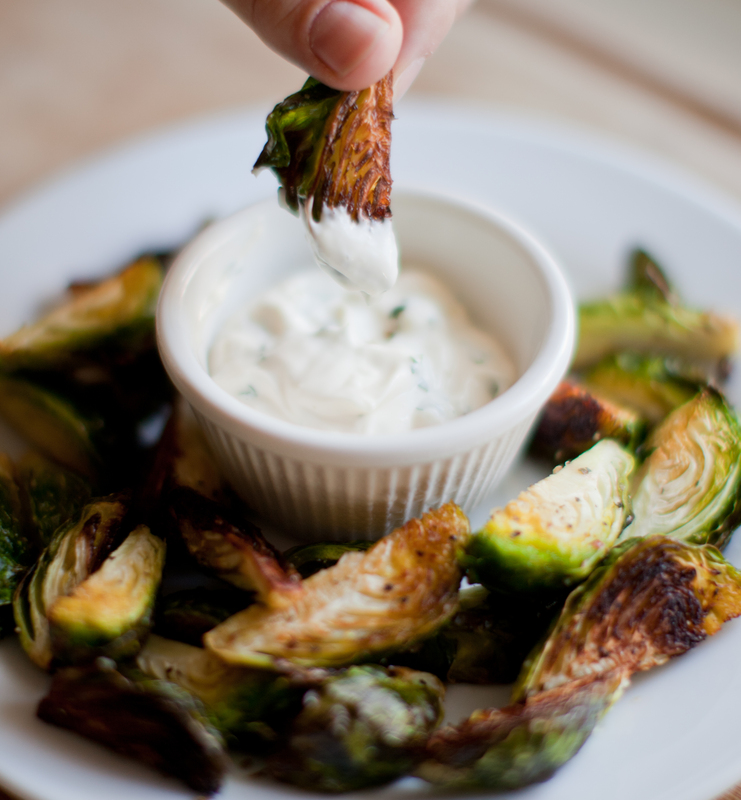 My husband and I absolutely love this Crispy Brussel Sprouts with Garlic Aioli recipe! The combination of flavors is awesome and I have a very hard time not devouring it. I’ve made it several times already and plan to make it again and again. Thank you so much for this. Anna! Thank you so much for your comment. It really means a lot to me and I’m very glad you’ve enjoyed the recipe so much! Would olive oil be an acceptable alternate to the canola oil? Absolutely! I prefer canola for this particular recipe because it seems to crisp up the brussel sprouts a little more and I like it doesn’t compete with the flavor but either would be fine. Yum – thank you! Perfect Summer snacking! This looks so good! I’ve been looking for a good brussel sprouts recipe for a long time and I’ve finally found it. Thanks for sharing! Brussel Sprouts are one of my all time favorites. My 9 year old daughter and I eat them a couple times a week! I do not like Brussel sprouts! BUT, I made this and had to make a second batch immediately because they went so quickly. Absolutely delicious! We made these today. I love brussels sprout, but my husband was giving them dirty looks. When he tried it, he said “Hey! I like brussels sprout!” 🙂 Great recipe, we loved it! I found this on Pinterest – amazing recipe! Love it!! I added a little bit of cayenne pepper (instead of the parsley) to give the aoili some heat. Delicious!! Great idea on the cayenne! I love heat….. These were amazing! I found the recipe through Pinterest and couldn’t wait to try it. I just ate the last one and am already wondering if I could make more later tonight for a snack! Yum! Found this on Pinterest! Made them for dinner tonight and it was a true hit! Thanks for sharing this delightful and easy recipe!! I am really trying to like brussels sprouts. This one is very tempting. I made this for a side with our dinner tonight. My husband and son loved it. Can’t wait to make this for my next dinner party!! Yummers!!!! I know I would love this! Trying this tonight, but using original amount of the garlic!! This recipe sounds so good!! My mouth is already watering – I have to try it! My mom gave me some fresh brussel sprouts. I was just about to google some recipes when I saw this on pinterest. Making it today for my husband and I! Thanks. This is a truly great recipe. Easy, tasty, (mostly) healthy! Mmmm! These look SO good! I am going to try them this week! Thanks!!! Excellent recipe. Never think about make them in different way than boiled. This look yummy. Thank you for sharing this delicious recipe with us. hm…I am not a big fan of brussel sprouts, but I will try this…”Everything should be made as simple as possible, but not one bit simpler.” by Albert Einstein. I never tried garlic with brussel sprouts…I wonder how it will taste…hopefully I like it. Appreciate your work! Thank you! I don’t like mayonnaise, what can I use instead? I haven’t tried any other dipping sauces for this recipe other than the mayonnaise based one. A combination cream cheese and sour cream might be a good substitute. Let me know if it works out! So far, this is the only recipe for brussel sprouts that my stomach can handle. THANKS! Yes, I think this recipe will be the only one I cook from now on, when it comes to brussel sprouts. Excellent idea. Never tried anything similar. Look yummy. Seem that used in this way garlic do not leave that specific taste in mouth. A wonderful blog. Your way of thinking is remarkable! Thanks for this amazing recipe…really appreciate it. I tried many different recipes for brussel sprouts and this one is the best. Lovely! Thank you for this. Love brussel sprout..
Lovely recipe, I will definitely try it out very soon! Made these tonight, first time with fresh brussel sproouts. I didn’t have any parsely so I used fresh dill, was soooo good! I just inhaled all of these by myself. These are amazing! Pingback: Girl’s Night: Pinterest Fooding | To be Consumed. We had these for dinner last night. The first time I deep fried Brussel Sprouts (cooking these for about a year) my Fiance’ thought I was crazy! We have made these for friends that said they did not like Brussel Sprouts at all. When they tried them, they wanted to know how to make them. Your sauce will be an added flavor I’m sure. Thanks for sharing. I made this and followed the recipe to the T…….I’m telling you What…..It was Fantastic!!!! So glad to have found this…makes a HUGE difference in the taste of brussel sprouts!! I will buy them fresh and cook them this way from Now on!!!! The aioli was also delish!!! I used Hellman’s. They were a hit at Thanksgiving. Thanks for the recipe! You should have a link on here for Pinterest so it can be posted for others! I just made these and they are wonderful! Thank you. Using canola oil made all the difference! I have now made this 3 times and will again today. It’s our new favorite side dish! I repinned this from a friend…holy cow…nom nom…would NOT change a thing…thank you for your recipe…its awesome and anyone who tries it is in awe of the sprout! I’m making this tonight!!! I was planning to roast some brussel sprouts so why not jazz them up a bit! Thanks for sharing! Is this best served hot or can the sprouts be room temperature? I want to make them early in the day so as to try to get the smell out of my house before dinner :)! Can’t wait to try this recipe…I love sprouts! When you roast brussel sprouts they aren’t nearly as bad smelling as when you boil them. You should be fine to make them right before serving! This sounds delicious! I want to serve as an appetizer at a party – aka – it’ll get cold. Anyone know if it still tastes good if its prepared in advance & served room temp? Its still pretty delicious at room temperature but you can easily put the brussel sprouts in the oven when 15 minutes before the guest arrive and they’ll be hot and ready to go! I have always loved Brussels sprouts, but when the edges are all crisped up and caramelized, like in this recipe, they are extra special, with or without the aioli YUM!! Pingback: 9 Brussels Sprouts Recipes to Make Anyone a Believer : Be Live….. I had some roasted brussels in a salad the other day and they were fabulous. I can’t wait to try this recipe, but I’m afraid I’ll have to use a light olive oil because we don’t do canola (can’t stomach the stuff). Thanks for sharing. Pingback: Thanksgiving 2013 Snapshots | Cin Cin, Let's Eat! I never thought to serve roasted brussels sprouts as an appetizer. Perfect. Thank you, Anna! Just made this ! The ali was great …I love garlic and a bit of heat so I added a pinch of garlic powder and paprika~~yummy…my brussle sprouts didn’t come out quite crispy…I really enjoyed the stray leaves that fell off and got crispy like chips lol…even better than kale chips heh heh thank you for the recipe! These are truly amazing. My family loves them! I made a slight modification and added a half teaspoon of pureed ginger to the mix which gave a really nice flavour to the roasted sprouts. A definite keeper of a recipe. Made these last night and they were soooo yummy. I skipped the aioli and squeezed some lemon on them right out of the oven and dusted them with some garlic salt before serving. Hi I was wondering if using frozen Brussel sprouts would work alright? I am from the Midwest and have yet to find any fresh sprouts at the market. Hoping to make them tonight if frozen will work. Thanks for the comment! I have never tried frozen brussel sprouts….If you do try and roast them, I would thaw them completely and then press out any moisture with a paper towel. If there is moisture in the sprouts them they will be steaming more than roasting in the oven…Let me know how it turns out! Grapeseed oil is a great neutral oil to use instead of canola. I don’t cook at all, but I’ve spiked a sudden interest thanks to a visit to my Mom, who is a wonderful cool. One of my very favorite foodsnisnfroed Brussels with some sort of aioli from this really nice resturant I my hometown. Well the look of these Brussels reminded me of that. I tweaked it a little. Cutting them and then peeling the leaves to cook leaves, so is have Brussels leaves. Leaving in the rest or course. I used really good olive oil as well. It worked. I also used 5 tbs sirracha mayo and 1 Tbsiricle whip for the aioli, it’s all I had in hand, I added a little extra lemon juice and garlic to taste and texture, l then heated it for 10 seconds with wrap over it in the microwave and gave it a stir. Then another 10 seconds and stir before serving. I cooked the Brussels leaves in the oven 8 min then stirred the. Another 8 then transferred to pan for quick fry, then back to oven with many Stirs. It came out GREAT! I didn’t think cook , but I loved it, and my husband who is brutally honest said it was the best thing I’ve ever cooked and it tasted like the stuff from the restaurant. I fixed these last night! Oh my goodness!! I was in brussel sprout heaven!! Kudos to you and this recipe!! This is an amazing treat. My daughter made them for an appitizer before our Christmas dinner. I will definitely be making these when I have my girlie frieds over.